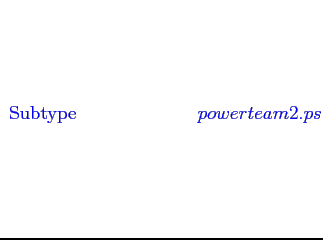 PowerTeam is a dynamic power simulator. It is integrated with Verilog and provides power simulation and analysis capabilities to Verilog on top of Verilog's functional and timing simulation capabilities. Interface to Verilog is through PLI. Verilog-XL and VCS are supported. In addition to PLI interface, power simulation requires a power library which describes different power dissipation modes of the library elements. Various power dissipation parameters are also contained in this library. Unlike other power simulation tools, PowerTeam is ``cell'' based, where power characteristics of an ASIC cell are behaviorally modeled just as its functionality. Most other gate level power simulation tools confine themselves to the periphery of the cells. They ignore what may be going on inside or they try to match the simulation vectors to guess what input changes triggered what outputs and try to correlate them to a timing/power vector. Behavioral modeling allows taking into account the ``state'' of the cell during power simulation. The power models are automatically synthesized into Verilog by VeriGen which analyzes all possible power dissipation scenarios and generates Verilog code which will activate them as the situation arises during simulation. Power models can be generated by SolutionWare tools for standard cells, IO cells with multiple supplies, and for memories. This makes whole chip dynamic power simulation a reality so long as the chip can be simulated in Verilog. PowerTeam is a very accurate power simulator. This is because a very detailed power characterization of the cell is performed using SPICE. That includes not only output switching energy dissipation, but includes input switching energy dissipation, which happens a lot more frequently. In addition, PowerTeam can tract the duration of each power event. All significantly different power dissipation modes are identified by StateGen, and LibChar measures the power dissipated as the load and input slew changes. Switching energies are calculated using a two dimensional look-up table. By increasing the number of entries in the tables, the accuracy of the results can controlled. The size of the tables do not slow down the power simulation. SPICE inputs for measuring power dissipation are generated by StimGen automatically from ACDL inputs. Power events are approximated by rectangular pulses. Duration of the pulse is also measured by LibChar during characterization. Although there could be inaccuracies in instantaneous power dissipation as a result of the pulse approximation, energy dissipation is not dependent on it. As a result, the accuracy of the total energy dissipation could be as good as what may be obtained from Spice. Power aware Verilog models for the cells, schedule power dissipation events to be carried out over a period as inputs change. These events cover output changes as well as internal state changes. The latter events dominate in a digital world, although each one of them consume very little energy, are very important because of the frequency of their occurrences. Reliable timing simulation is a requirement for reliable power simulation. PowerTeam includes an integrated delay calculator to predict the precise times at which inputs will trigger power events. The loads at the outputs of the gates could be either estimated based on the fanout tables, or they could be back-annotated after extraction. After determining the effective loads and input slopes, power dissipation is calculated for each input event and timing arc along with the estimated duration of the event. Special attention is given to simultaneously switching outputs at this stage. PowerTeam is integrated into Verilog, industry standard for digital simulation. Compared to timing simulation, run time of power simulation is 10X slower. Still, compared to transistor based power simulation options, it is orders of magnitude faster. In addition, it provides a lot more detailed information on how the power is being dissipated which can be quite valuable in power optimization. Whether you are doing a timing simulation or a power simulation, there is no change in the simulation setup. Power events can be monitored using Verilog's programming capabilities, and the results could be tabulated or viewed using Verilog's native capabilities. which report any of total dynamic power, total internal energy use, capacitive portion of the total energy use. Total energy use is the sum of totalIntEnergy and totalCapEnergy. As the state of the cells change as a result of changes at its inputs and outputs, the static power dissipation of the cell changes. Such changes are propagated up through the design hierarchy. Power monitors can be assigned to different sub-modules using PLI calls to see detailed power usage of individual modules. In addition, PowerTeam keeps track of various power parameters and dumps them on demand or at the end of simulation for all the modules and cells. Whenever an input toggles, it triggers a power event of a finite duration. When output toggles, duration is assumed to be the delay of the last changing output. When there are no outputs changing, power pulse width measured by LibChar is used. Almost all alternatives to PowerTeam have no concept of the duration of the input event if it does not trigger an output. Most of the power events fall in this category, any peak power reported without tracking the duration of input events is bound to have large errors. The power consumption changes occurring as a result of input changes are propagated up though the design hierarchy. This enables to see how power is consumed by different models. PowerTeam reports power dissipation of various modules following the hierarchy of the design. These reports may be static power or total energy consumption of each module and its siblings. Energy consumption can be further split into energy consumed due to capacitive loading and internal energy consumption. Internal energy consumption is a measure of the quality of the cell libraries. It can be used to identify ways to improve the performance of the cell libraries. Capacitive energy consumption can be used to direct floor planning and routing. Since PowerTeam requires no change in functional and behavioral simulation environment, it can be integrated into RTL design flow and used for interactive power optimization. It requires a cell library which will be used for synthesis to generate a gate level netlist. Power dissipation of different modules making up the TL design can then be reported using the simulation vectors used in TL verification. Once the most energy consuming component is identified, it can be modified to reduce circuit activity. Process continues until lower dissipation goals are satisfied. At this stage, wire capacitances can be estimated. Precise loading is unlikely to effect the energy consumption profiles of different modules, even if the actual values change. centerlineDesign Better Cell Libraries Cell libraries are typically designed with time to market considerations in mind. A generic library may not be the best choice for implementing low power/high performance design. After RTL power optimization possibilities are exhausted, power reports generated by PowerTeam can be used to identify cells which are consuming excessive power. For each module, energy consumed by the cells making up that module can be reported. Such cells can be redesigned to reduce their power dissipation by CellOpt. If, for example, flip-flops are responsible for 30% of the power consumed by a module, better lower power flip-flop may significantly reduce the power dissipation of this module.